Ah, the joy of firmware debugging! I’ve been working on a USB firmware for my new upcoming product that involves a dual traditional TTL (Serial) and a USB-TO-SERIAL converter (CDC Communication Port) implemented in the same firmware. The firmware was written in C18 , using the USB stack from Microchip Applications Libraries. 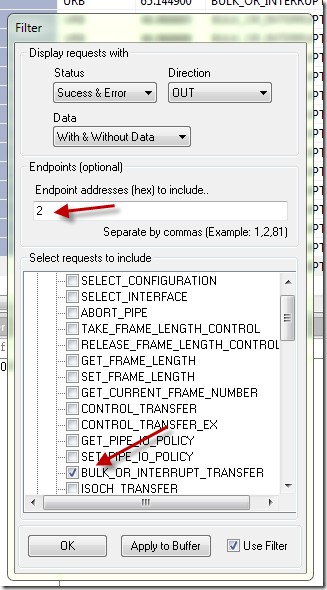 Everything worked well until I suddenly discovered that while sending data over the CDC port from the computer to the device, the device would *sometimes* receive garbage data instead of what I sent. This wouldn’t be so discouraging if the data received would be the same, or at least this would happen always not *sometimes*. The bug was caught in the act on the screenshot below, the arrows show the data I actually sent ‘stop’ followed by LF (0xA) char and the character codes (in decimal) actually received. This is garbage because 92,162,62,180 are note the ASCII chars for ‘stop’. Please note that this will only occur *sometimes*, however I could almost consistently repeat it after several retries of sending a command to the device. The tracking of this bug turned out to be so adventurous and involved that I decided to write a tutorial about it. It involved some tools that I didn’t use often before, but now they proved indispensable in locating this furry and fuzzy code pest . As you’ll see at the end of the article the bug was pretty obvious at least for me (I already made this mistake many times , but forgot about it), however it might be really useful for someone just starting working with microcontrollers, C and/or interrupts. It also provides an opportunity to review some tools I used in the process. Here I was able to set the Direction of the packet – OUT. Please note that for USB packets , by convention , the direction is as looking from host – so OUT from computer to device. 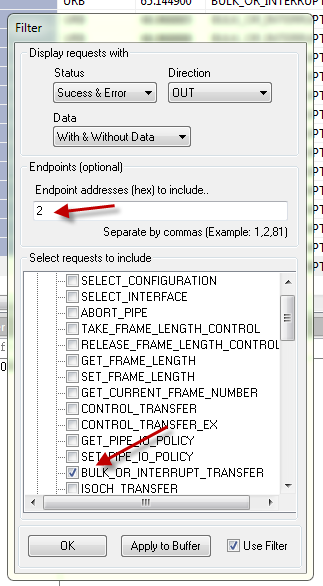 I also set the CDC OUT endpoint as specified in my firmware #2, finally I set the request type to BULK_OR_INTRRUPT_TRANSFER. 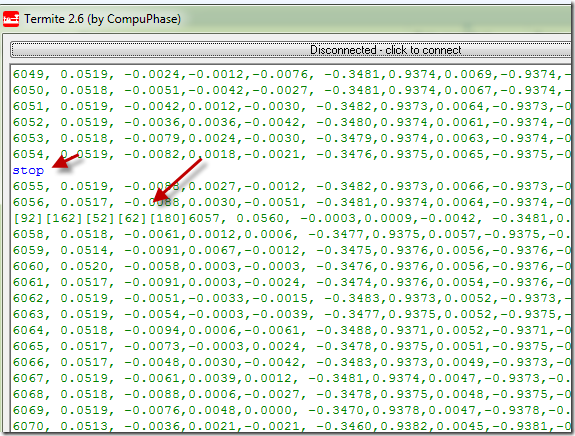 The data is completely correct, so my first guess is ruled out. Let the bug hunt continue. Moving on to #2. I had a look at the cables, I had a look at the device, I knew the hardware setup worked perfectly before. If I had a hardware USB analyzer I would hook it up. But I didn’t so I took a leap of faith and I skipped #2. This wasn’t by the books. However it was all I could do in reasonable time. So moving on to #3. Once you download the USB stack, and integrate into your project , it becomes part of your project. So tracking Microchip’s bug was no different than tracking my own code bug. So I moved to #4 and handled #3 in the same step. Ok so here we are in the MPLAB IDE 8.83. 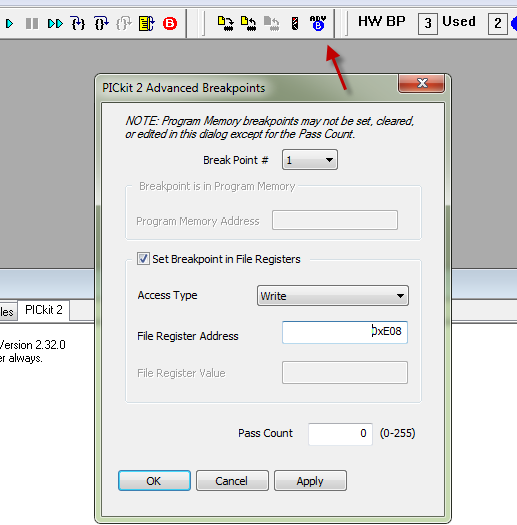 My PIC device is capable of up to 4 Hardware breakpoints. This means that the MCU can halt on specific memory locations, it also can halt when a specific memory location is written or read. 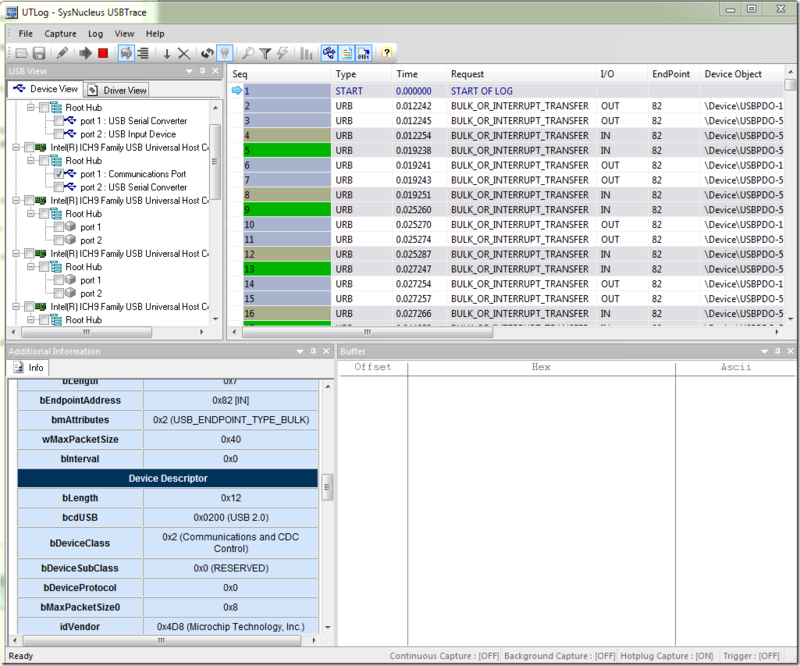 By scanning through the USB Stack code, I found that it stores the incoming USB CDC data in the cdc_data_rx buffer . 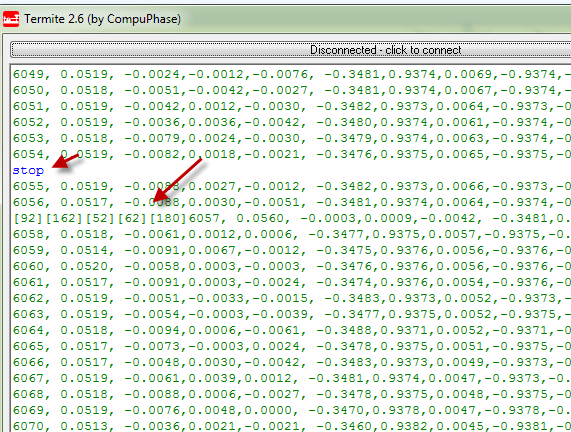 From the .map file I was able to determine that this buffer address is starting at 0xE08. The MAP file is basically a file the compiler creates and where you can find all your variables and code and at what address they are stored, look for it in the same folder where you output .hex file is. I just punched in the address of my buffer, selected access type as Write. Now when the first byte in the incoming CDC buffer is written with good / or garbage data the code should break and point me to where the data writing happened. Again I stared sending data, and I had to click on the green debug run icon couple of times, to skip through good cases until the bad garbage write happened. The MPLAB debugger didn’t stop every time the bad case happened , I am not sure if this is a limitation of the debugger or something caused by my code bug, but finally it stopped at a place where I defined some code that was executed inside an interrupt. This is because this is a 2 bytes variable . Now think what would happen if the interrupt happens between these two instructions. The interrupt mentioned above modifies the variable. 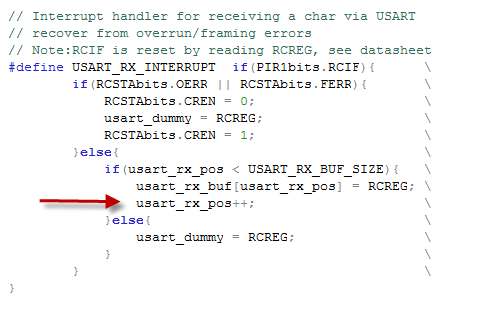 So while the main code thinks it has “0” in usart_rx_pos, in fact it only sets to 0 the second part of the variable the first one could have been modified by an interrupt! 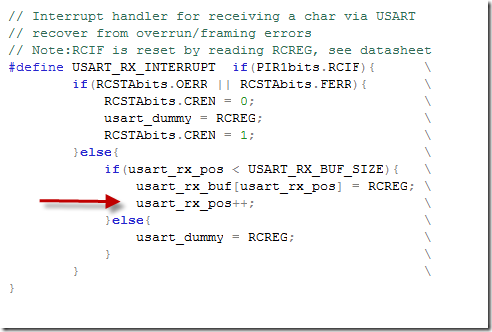 Thus the unpredictable behavior … usart_rx_pos becomes a random variable which causes the buffer overflow. 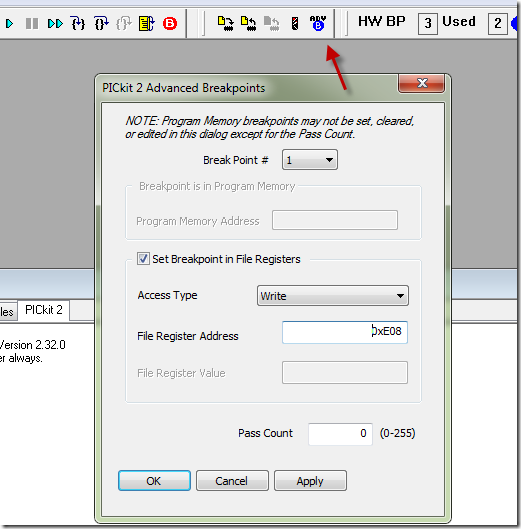 Data is written at random locations in program memory . Scarrrrrry ! It removes the second assignment of x since it considers it redundant, while in fact if you have an interrupt executing let’s say before y=0 , and modifying x=0 thus in this case the x=1 at the end is necessary ! So ‘volatile’ basically tells the compiler that a variable can change suddenly ‘out of the blue’ and it should take care while optimizing the code and not to remove any assignments even if they look redundant. Please note that I didn’t have to disable all interrupts, it was enough to disable only the interrupts that would cause our variable to be modified (the USART Receive interrupt). It’s enabled or disabled by the RC1IE flag in PIE1 register. After testing this new code, the problem was gone. So now I am thinking “everything is for the best” , I spent some time tracing a bug, but I learned along the way and sure thing I wrote this tutorial so I never again forget that interrupts can modify variables when you don’t expect to ! B. Disable the interrupts that can modify those variables, while working with these variables in a non-interrupt code (both reading and writing), this will create a so called ‘atomic’ code, called so because it cannot be split by an interrupt. C. Keep ‘the atomic’ code short – the interrupts can wait , but not for too long in some cases. For example the hardware USART buffer on my device only has 2 bytes – so it would get filled and lost soon if the processing done in the interrupt would be halted for too long.